The following list contains mainly Jewish-interest music links. There are also a number of links which, although not of specifically Jewish interest, lead to information of a technical nature within the context of music. These include a page of links to search engines and searching tips and techniques. You can search this page easily by typing 'Ctrl-F' on the keyboard to invoke the Windows search facility. It will find, display and highlight your search keyword wherever it occurs in this page. My thanks for additional information go to Roxy Boleyn, Prof. Dr. M. Edelman, Prof. Lewis Glinert, Mason Weisz, Tzvi Pincas, Margit Hagan and Irwin Oppenheim. and Hebrew script included. Workshops for music teachers. Authors: Henry Sapoznik, with Pete Sokolow. Publisher: Tara Publications, Cedarhurst,N.Y., USA. Format: 80pp. 21.5cm W x 27.7cm H. Paperback. Spiral bound. 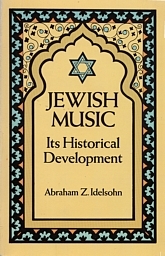 Publisher's comment: This book describes and assesses the relative preponderance of composers of Jewish descent, particularly during the last two hundred years, giving a history of composers of Jewish descent from biblical times to the present day, and assessing the importance of composers of classical music during the last two hundred years. Publisher: Jewish Publication Society, USA. Funny, It Doesn't Sound Jewish: How Yiddish Songs and Synagogue Melodies Influenced Tin Pan Alley, Broadway, and Hollywood. Publisher: Schocken Books, New York. Format: xvi + 535pp. Index. 13.4cm W x 20.2cm H. Paperback. Publisher: Raz-Ot Institute, 5 Amos Street, Geulah, Jerusalem. Publisher: Workmen's Circle, 45 East 33rd Street, New York, NY 10016, USA. Format: xii + 288pp. 21.4cm W x 27.4cm H. Paperback. ISBN: none. Library of Congress Catalogue Card: 50-14685. Publisher: Stein & Day, Scarborough House, Briarcliff Manor, NY 10510, USA. Format: xvi + 207. 20.4cm W x 27.9cm H. Paperback. Twenty-two databases, 17 million bibliographic records. A financial derivatives service having nothing to do with cantors or music. Sepharadic cantorial art, see Sepharadic Pizmonim, below. Extensive collection of on-line audio files; click & listen. Needs Winamp player. Guild of Temple Musicians (Reform). Affiliated to ACC. From the WCN home-page: Women cantors have been recognized and accepted into all liberal cantorial schools and organizations. Yet the need for women cantors to come together has not diminished. Networking among women encourages and inspires us as we share knowledge and experiences in balancing our relationships with congregations, families and friends. The membership benefits of conferences and phone networking has broadened with the regular publication of a newsletter beginning in 1983, the writing of a constitution and by-laws in 1993, the commissioning of new Jewish music in 1997, and the creation of an on-line list-serve network in 1998. An Old Country Passover - a selection of nineteen short audio files recorded live by Rabbi Peretz Weizman, in April 2001, at the Chesed Shel Emmes in Winnipeg. Shops in Bnei Brak, Haifa, Jerusalem and New York. Irwin Oppenheim's comprehensive site on Jewish liturgical music, with a large collection of cantorial sheet music, annotated links and background information. 55/56 Lincoln's Inn Fields, London, WC2A 3LN, England. Also listed above under A Cappella as Hasidic Cappella. Telephone: +44 (0)20-8455 5276. Ask for Hagai. Zamir Choral Foundation, New York, NY, U.S.A. The Foundation, founded and directed by Matthew Lazar, sponsors a wide range of programs in Jewish choral music, including the Zamir Chorale (the original, founded in 1960 by Stanley Sperber), HaZamir: The International Jewish High School Choir, and the North American Jewish Choral Festival. In October 2005 was seeking a composer to write musical scores. Alexandr Morduhovich - Jewish composer, educator and musician. Lior Navok - Jewish composer and orchestrator. Based in Israel. Nikos Pogonatos - pianist, composer, arranger, teacher of music. Based in Switzerland. Founder, 2002, Klezmer Trio Chalojmes in Zürich. Yiddish and Jewish songs. Audio clips on web-site. Web: http://www.hike.te.chiba-u.ac.jp/eem/ 25 music audio files. Friedman, see Debbie Friedman, above. Gratz College, Melrose Park, PA, U.S.A. The College offers an MA in Jewish Music program which trains hazzanim and other Jewish music professionals, as well as an extensive library of Jewish music, including the world-renowned Eric Mandell Collection. Publisher: Dover Publications, New York. 1992. Roots of Klezmer, see Klezmer/Lost Trails, below. Music in Israel - Daily listing of all classical music concerts and opera in Israel in English with links to orchestras, choirs, groups and concert halls etc. Tanja Solnik's From Generation to Generation: A Legacy of Lullabies, traditional Jewish lullabies sung in Ladino, Yiddish and Hebrew. Eleven lullabies sung in Yiddish. Lyrics and translations. RealAudio link. The Jewish Music Research Centre of the Hebrew University in Jerusalem, founded in 1964 by Prof. Israel Adler, is dedicated to the documentation, research and publication of scholarly materials about Jewish music. Research encompasses two main areas: ethnomusicology, which deals with Jewish oral traditions, and historically-oriented research based on written documentation. Collecting and studying all documents pertaining to the musical traditions and the musical life of Jewish communities, past and present are primary tasks of the Centre, as well as, preserving these materials, cataloguing and making them accessible to the scholars and individuals interested in Jewish music. The JMRC carries out many projects in conjunction with institutions and researchers in Israel and abroad. Please see our unique Thesaurus of Jewish Music, a bibliographic and music source, which may be searched by category, tradition, country or author. Music Publication & Music Notation Service. 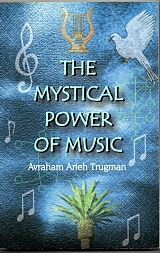 There is an English-Hebrew glossary of musical terms. Extracts from a 62 page article by Josh Horowitz and originally written for publication in Musica Judaica. Includes links to further pages at KlezmerShack.com. Web: http://www.klezmershack.com List of bands ranked by name and location, sheet music, instruments. Lost Trails - Shane Solow's recordings of musicians in northern Romania who play archaic melodies which are a prototype for Klezmer music. They learned the melodies from Jewish musicians who lived in this region before the Second World War. They are some of the last performers who know this tradition. Chalojmes Klezmer Trio, Zürich, Switzerland. Based in Detroit area, U.S.A.
Java Jews Klezmer Band of Iowa, U.S.A. Established 1996. Wide variety of Jewish music - klezmer, Yiddish and Israeli, Russian and American (swing, standards, Broadway, jazz); and an a cappella group,focusing on Shomer Shabbat simchas. Klezmer Festival Band, London, U.K.
Telephone: Gregori Schechter, +44 (0)20-8952 2996. Klezmer Juice, Los Angeles, U.S.A.
Kol Haruach Klezmer Band, Rockville, MD, U.S.A. Available for Simchas large and small, the Kol Haruach Klezmer Band has been performing since 2001. Their diverse repertoire includes Klezmer, Israeli, Jazz and Swing. The five piece touring ensemble has been featured in numerous publications including the Washington Post and the Washington Jewish Week. Manager: Brian Choper, +1 (0)301-441-8899. Rock & Rollmops, London, U.K.
Tantzunlid Klezma Trio, London, U.K.
Ladino, see Choral / Ladinostalgia, above. Popular, classical and religious music. 2.5 x normal size. LPM (London), P.O. Box 47, Stanmore, Middlesex HA7 3BD, U.K.
Maven: Jewish-interest resources in Israel and world-wide, including music. A 'several times a month' e-mail listing of Jewish-interest Internet resources, including music. To subscribe, go to either of the two Maven web-sites above and click on the SUBSCRIBE button. The term MP3 is derived from Motion Picture Experts Group (MPEG). recording only the changes in succeeding frames. the audio data which are inaudible to the human ear. decide whether or not make files available for supply to other Napster users. The original source of the music may be a copyrighted CD. a free program which is also completely decentralised in the way it operates. A project whereby "... decoding the Hebrew letters of the Torah into their own musical notes, we have made the power of the original Hebrew text of the Bible available in the universal language of music." Audio clips. MuSICA Database - science and theory of music. National Sound Archive (UK), part of the British Library. Sound files are in RealAudio format.There is a button to download RealPlayer software. See also "Composers of Classical Music of Jewish Descent " listed under Books, above. Russian cantor and singer. Died 2002 aged 88. Bogdanski, Majer. Tailor, musician and folklorist. Born Poland, 1912, died London, 2005. 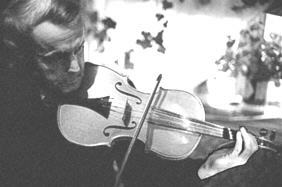 One of the greatist violinists of the 20th century. Born Soviet Union, 1920. Moved to Los Angeles, 1921. Died Manhattan, 2001. You will get much more information from the Telnet link than from the web-site. Telnet is a pre-Windows non-mouse system and may present you with unfamiliar options. It relies upon typed data entry via the alphabet and number keys, the cursor keys and the return (enter) key. It is easy to use and if you are clever enough to use Internet Explorer or Netscape then you should have no difficulty with Telnet. In its time it gave easy, swift access to enormous on-line resources and may still do so. login: library; a password is not needed. Judeo-Arabic, French and Spanish. Slow to load. BSZNet: Gateway to Sephardic Resources. Visit the BSZ Hall of Music! of Jewish music and included a lot of info on Sephardic music. Judy Frankel's website. Her singing is delightful. There is also a new book by Kay Shelemay called Let Jasmine Rain Down. Downloadable MP3 tracks containing some Jewish content. Michael Chusid, is "an experienced ba’al tekiah – shofar master blaster – and author of Hearing Shofar: The Still Small Voice of the Ram’s Horn. He has taught shofar at Hebrew Union College, American Jewish University, and throughout the US and Canada." His shofar web-site is at http://www.hearingshofar.com/. Playable 6-hole shofar: http://www.music.iastate.edu/antiqua/shofar.htm [includes an audio clip]. This modified shofar would not be kosher for use on the Yomtovim. However, since the Tekiah Gadola blasts of the kosher shofar signal the formal end of Yom Kippur, I should then love to hear a shofar rendering of Hatikvah. Nomi Teplow (Israeli vocalist. Contemporary Jewish music concerts in Israel and U.S.A. Meets once a month in the London, U.K., area and welcomes everyone who enjoys singing to learn, teach and share Jewish songs of all types, learning informally by ear using song sheets with transliterated words. All levels of musical ability welcome, including none. Led by experienced song leaders and teachers. Informal and friendly atmosphere. Cost £3. Get more information from Diane [diane@major7th.com]. GreatJewishMusic.com: a site to learn Jewish songs through MIDI and audio samples. Links to resources for on-line Jewish music. This has nothing at all to do with dinosaurs. The name is derived from the Greek stegein grajein or "covered writing." It is the science of hiding data within other data. Digitised music and pictures are ideal media for this purpose. Uses of steganography include hiding your name, serial numbers and copyright information in various places in your digitised music in the hope that it may prove valuable in court against counterfeiters. The hidden data is almost impossible to detect. The process is also known as watermarking and fingerprinting. The brand-name 'Steganos' is in use  for a computer security product. A book which deals extensively with this subject is Disappearing Cryptography by Peter Wayner. ISBN: 0-12-738671-8.
nothing to do with Thomas Tallis, music or talleisim. ... is an information services company which provides library management systems. This is a division of the Union of American Hebrew Congregations.